Sparex ® - Krohn Industries, Inc.
Sparex® is an easy to use, longer lasting, safe replacement for dangerous sulfuric acid in effective cleaning and pickling of metals, and produces smooth, clean, bright surfaces quickly and economically, without destroying fine detail or tolerances by minimizing the risk of over-pickling, pitting, burning, and wire brushing. The prepared solution has 1½ times the available acid content of a 5% sulfuric acid solution and is more effective than citric acid pickle. Use it to replace expensive acid or sodium bisulfate based plating neutralizers and activators. Mix Sparex(R) at half the strength recommended for pickling and use it as you would use the acid or sodium bisulfate based plating neutralizers and activators. 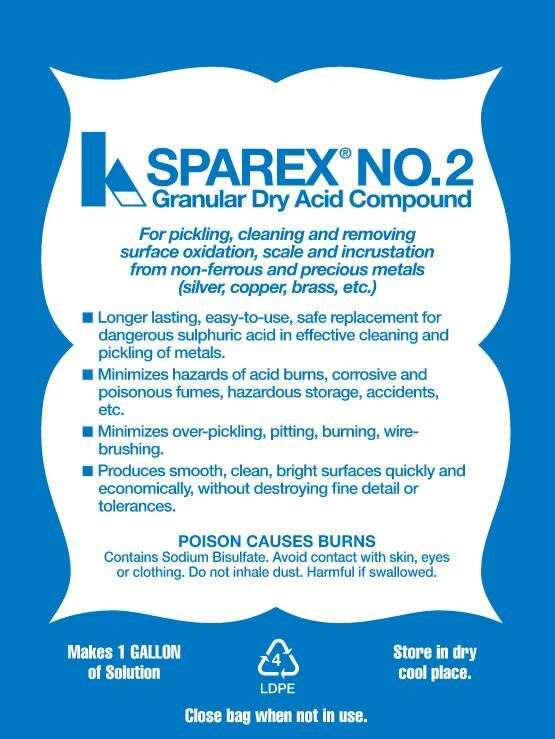 Use Sparex ® No.1 for pickling iron and steel. Available in 2½ pound cans (makes 1 gallon of solution) and 45 pound drums (makes 18 gallons of solution). 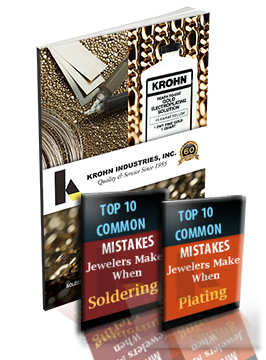 Use Sparex® No.2 for pickling gold, silver, and copper based alloys. Available in 10 oz. cans, 2½ pound bags (makes 1 gallon of solution), and 45 pound drums (makes 18 gallons of solution).